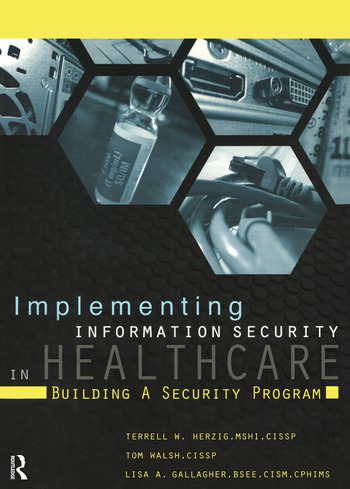 Implementing Information Security in Healthcare: Building a Security Program offers a critical and comprehensive look at healthcare security concerns in an era of powerful computer technology, increased mobility, and complex regulations designed to protect personal information. Featuring perspectives from more than two dozen security experts, the book explores the tools and policies healthcare organizations need to build an effective and compliant security program. Topics include information security frameworks, risk analysis, senior management oversight and involvement, regulations, security policy development, access control, network security, encryption, mobile device management, disaster recovery, and more. Information security is a concept that has never been more important to healthcare as it is today. Special features include appendices outlining potential impacts of security objectives, technical security features by regulatory bodies (FISMA, HIPAA, PCI DSS and ISO 27000), common technical security features, and a sample risk rating chart.